This is the second part of a two-part series on how to teach the Bible through discussion without missing the point of the lesson. Motivational speaker, Zig Ziglar is credited with the axiom, “If you aim at nothing, you will hit is every time.” If you don’t know what you are trying to teach, there is no way anyone else will either. Discussion based teaching should not be used as an excuse for lack of preparation. Be flexible, but write down 1 to 3 goals, truths, or principles that you want to communicate. Open-ended questions are designed to solicit participation and information from the group. They are questions that require more than a one word answer. When used strategically, they can create momentum and buy-in. Open-ended question help you connect with your students, but they also help your students connect with each other. As group members hear others respond to questions they are urged to share their perspective and insights as well. In part one of this two-part series, I listed distractions as one of the challenges that small group leaders have to overcome – they are inevitable. Instead of the ignoring a distraction, identify the “elephant in the room” and move on. And don’t forget to laugh, when appropriate. If something happens that is funny, enjoy the moment use it to bring your group closer together. Group discussions can become unproductive or confusing without some leadership. When needed, restate participants responses and ask if that what they meant, if they are unclear. This kind of clarification can also be a good way to transition to another stage in the meeting or point in the lesson. It gives the leader an opening in the discussion while affirming the rest of the group. Part of a group leader’s job is to keep “the ball going.” If some of the members of your group are shy or introverted, you may have to find ways to engage them without embarrassing them. You may also have to gently restrain over-talkative group members by thanking them for the participation and asking others to chime in. Do you have any suggestions you would add to the list? 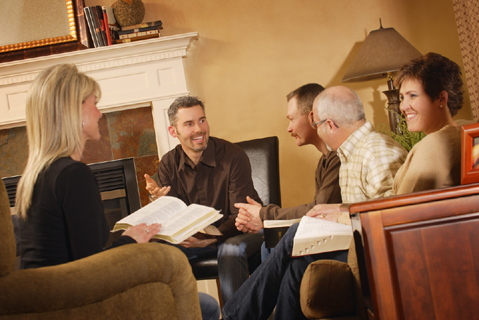 What have you found helpful in teaching the Bible through discussion without missing the point? This entry was posted in Bible Study, Christian life, Church life, Leadership and tagged Bible study, group dynamics, small group, Sunday School. Bookmark the permalink. Thanks David. I really appreciate your comment about the group leader allowing the discussion material to affect them personally. I agree that that is important and can be left out in the busyness of preparation.